"The 404" redirects here. For other uses, see The 404 (disambiguation). King's Highway 404 (pronounced "four-oh-four"), also known as Highway 404 and colloquially as the 404, is a 400-series highway in the Canadian province of Ontario connecting Highway 401 and the Don Valley Parkway (DVP) in Toronto with East Gwillimbury. The 50.1-kilometre (31.1 mi) controlled-access highway also connects with Highway 407 in Markham. Highway 404 provides access to the eastern edge of Richmond Hill, Aurora and Newmarket and the western edge of Whitchurch-Stouffville, in addition to the southern edge of Keswick. Construction on the freeway began soon after the completion of the Don Valley Parkway, with the first section south of Steeles Avenue opening in 1977. Over the next twelve years, the Ministry of Transportation of Ontario (MTO) undertook a continuous construction program to build the freeway to Davis Drive in Newmarket. This was completed on 24 October 1989. The route has undergone a periodic series of smaller extensions and widening in the years since, now travelling a further 15.5 km (9.6 mi) north to Woodbine Avenue near Ravenshoe Road in the town of East Gwillimbury. Future proposals may one day result in an extension to southeast of Beaverton. Highway 404 is one of several freeways in the Greater Toronto Area (GTA) with High-Occupancy Vehicle (HOV) lanes; the southbound lane was one of the initial projects in the province and opened on 13 December 2005. The northbound lane opened on 23 July 2007. Highway 404 looking north just north of the Highway 401 / Don Valley Parkway interchange, showing the interchange with Sheppard Avenue. Running parallel to Highway 400 approximately 15 kilometres (9.3 mi) to the east, Highway 404 extends 50.1 km (31.1 mi) on a north–south orientation between Highway 401 and Woodbine Avenue. There are 16 interchanges along its length, mostly of the Partial cloverleaf A4 configuration. Exit numbers on the freeway start at 17, suggesting that the length of the Don Valley Parkway was considered in distance calculations; until 2017, there were no exit numbers posted on the DVP. Officially, the Ministry of Transportation of Ontario (MTO) jurisdiction over the freeway begins as the opposing directions of travel diverge south of the Highway 401 interchange. [note 1] Northbound, two lanes from the DVP are joined by a third from the eastbound collectors of Highway 401. These narrow to two lanes before merging with a single lane from westbound Highway 401 immediately south of Sheppard Avenue. An additional two lanes from eastbound Highway 401 converge and form a separate carriageway with no access to Sheppard. Southbound, the freeway is divided into two carriageways, both of which provide access to the DVP. The outer carriageway also provides access from Sheppard and to Highway 401, including the westbound express lanes, while the inner carriageway is intended for DVP-bound traffic. The HOV lane also provides access to westbound Highway 401 via a dedicated tunnel, which passes beneath the other southbound lanes. To the east of Highway 404 is the Consumers Road office park. To the west and north of Sheppard Avenue is Fairview Mall, which has its own connection with the southbound lanes attached to the Sheppard interchange. The highway continues directly north along the old Woodbine Avenue right-of-way to just south of Steeles Avenue, where it diverges to the west before continuing north. From just north of Sheppard, a northbound HOV lane is present alongside the central median. Southbound, the HOV lane continues as far as Highway 401. Alongside Highway 404 to the east is an industrial warehouse and commercial office area, while on the west is a suburban subdivision of North York. Northbound, the freeway is six lanes wide from Sheppard Avenue to Finch Avenue, where one lane diverges onto an off-ramp, re-emerging north of Finch. Southbound, it is six lanes wide from Steeles south to Sheppard. At Steeles Avenue, the freeway enters the Regional Municipality of York. To the east are industrial units, while on the west are residential suburbs. This land-use persists north to the Highway 407 ETR interchange, a multi-level stack interchange with two flyovers. North of Highway 407, the freeway crosses Highway 7, where the HOV lanes transition to standard through lanes. The freeway passes west of Buttonville Municipal Airport and then interchanges with 16th Avenue. It narrows and the central barrier ends; a grass median taking its place between the opposing lanes. The land-use density continues to drop, with the appearance of some open spaces and farms interspersed with industrial and commercial buildings. By 19th Avenue, just north of the Honda Canada headquarters in Markham, the land-use is agricultural on both sides of Highway 404. Highway 404 continues north, forming the eastern boundary of the municipalities of Richmond Hill, Aurora and Newmarket and the western boundary of Whitchurch-Stouffville. North of Wellington Street, the highway reduces in width to four lanes, which is its configuration north through East Gwillimbury. The route continues, passing east of the community of Sharon, eventually curving northeast and terminating at an at-grade intersection with Woodbine Avenue immediately south of Ravenshoe Road (York Regional Road 32). A freeway east of Highway 11 was planned as early as 1954, when the province extended Highway 48 south from Port Bolster. A large cloverleaf interchange was constructed with the Toronto Bypass, and plans formulated for a dual highway around the east side of Lake Simcoe, connecting with Highway 11 near Orillia or Gravenhurst. This route was dropped when Metropolitan Toronto began planning for the northern extension of the DVP in 1957, as subdivisions encroached upon Woodbine Avenue north of Highway 401. The six-lane expressway was to follow the alignment of Woodbine from its southern terminus at Lawrence Avenue to north of Steeles Avenue, where the Department of Highways (DOH) would continue the road as a "new King's Highway". In 1959, the DOH announced that they would construct and maintain the new route once the DVP was completed to Highway 401 and designate it Highway 404. The proposed route of the freeway was presented at a special delegation on 13 December 1960 by Harold Barry, a representative of the department. Design work started in 1973, and construction began following the awarding of a C$6.9 million contract in March 1976. This contract included construction of the Finch Avenue interchange, overpasses at McNicoll and Van Horne Avenues and 4.5 km (2.8 mi) of six-lane freeway between Sheppard and Steeles Avenues. Shortly thereafter, on 20 April, Ernest Avenue and Van Horne Avenue were closed to traffic at Woodbine. The first section of Highway 404 between Highway 401 and Steeles Avenue opened in late 1977, including the flyover ramp from southbound Woodbine Avenue. The freeway was separated by a grass median with a steel beam acting as a barrier between the lanes. Construction north of Toronto proceeded quickly, with the contract for the section from Steeles to Highway 7 being awarded in 1976 and the section opening on 10 November 1978. The next extension, to Stouffville Road (then known as the Gormley Side Road), was opened ceremoniously on 9 December 1980 by minister James Snow; the segment north of Highway 7 was four lanes wide. Highway 404 looking southbound from Finch Avenue. Note the HOV lane on the left side of the carriageway. The section of Highway 404 north of Stouffville Road was the subject of considerable controversy when work began to clear the route on 15 May 1981 before the completion of an environmental impact assessment. The Ministry of Transportation and Communications was charged with violating the newly enacted Environmental Assessment Act, which it contested came into effect after construction of the Highway 404 extension had begun. Minister James Snow was charged with violating the act, and called upon to resign. The Minister did not resign, but paid a $3,500 fine. Despite the issues surrounding it, the extension between Stouffville Road and Bloomington Road was opened ceremoniously on the morning of 10 August 1982. Construction on the segment north of Bloomington to Aurora Sideroad was already in progress by this point. It was opened to traffic in late September 1985. Construction on the 6.5 km (4.0 mi) section from Wellington Street to Davis Drive began in early 1986, and the section opened to traffic on 24 October 1989 at 8:30 am. This final segment cost $22.1 million, ending the continuous construction program undertaken since 1973 at a cost of $83.3 million. Studies and environmental assessments into various extensions began almost immediately after the completion of the route to Newmarket in 1989; it would take over a decade for any northward progression to take place. The completion of the route to Davis Drive was met with scorn as traffic in Newmarket rapidly increased as the bedroom community grew with the new highway access. Municipal officials warned prior to the opening of the route that major traffic delays would be faced along Davis Drive. Then-mayor Ray Twinney began an immediate push to widen Green Lane – at that time an unpaved rural route – into a bypass of the town. Traffic delays were also compounded at the southern end of Toronto, where drivers whom had previously made use of Yonge Street, Bayview Avenue or Leslie Street would shift to make use of the new freeway. By 1992, York Region was moving forward with plans to expand Green Lane into a four lane road, while the province was urged to consider extending Highway 404 north to it, and eventually around the east side of Lake Simcoe. The province studied this and other options over the following years, before a formal announcement was made by Minister of Transportation Tony Clement on 22 June 1998 along with York Region chairman Bill Fisch. The plan called for an extension of Highway 404 north to Green Lane, and expansion of Highway 9 (now part of York Region Road 31), the western extension of Davis Drive outside town, to five lanes between Highway 400 and Bathurst Street. At the time over 20,000 vehicles used Davis Drive on an average day. In the interim period, work went into expanding the six lane freeway through Toronto and Markham. In early 1998, the MTO announced plans for two contracts to widen Highway 404 south of Highway 7. The first contract converted the grass median into an additional lane in each direction with a central barrier between them. High-mast lighting was also installed, replacing the unique luminaires used on the freeway. The second contract resulted in an additional lane in each direction on the outside the existing freeway south of Steeles Avenue, making it ten lanes wide. The proposal to eventually convert the inner lanes into HOV lanes was announced at the same time. The next year, Highway 404 was widened to six lanes between Highway 7 and Major Mackenzie Drive. On 19 June 2003, Transportation Minister and Oak Ridges MPP Frank Klees opened a new interchange at Regional Road 73 (16th Avenue). Traffic was permitted onto the ramp following the ceremony, also attended by Thornhill MPP Tina Molinari. One of the three original HOV lanes in Ontario opened on Highway 404 in late 2005; the other two were the lanes on Highway 403. In early 2004, construction began on a new ramp to westbound Highway 401, curving beneath the southbound lanes of Highway 404. On 13 December 2005, the southbound HOV lane was opened to traffic. Work on the northbound HOV lane began shortly thereafter, opening at 8:30 am on Monday, 23 July 2007. The MTO formally announced plans to alleviate traffic in Newmarket on 28 August 2000: a three contract project to widen and extend Highway 404. The first contract added an additional lane in each direction in the grass median from Major Mackenzie Drive to Bloomington Road. A second contract then extended those two lanes north to Aurora Sideroad. These two projects both began in the summer of 2001 and were completed in December. The third contract called for a four lane extension from Davis Drive to Green Lane and the reconstruction of Green Lane into a four-laned arterial road between Leslie Street and Woodbine Avenue. This contract began shortly after the announcement in September 2000. The extension was opened to traffic on 8 February 2002 at a ceremony attended by York North MPP Julia Munro and York Region chairman Bill Fisch. On 16 May 2006, the MTO announced plans to extend Highway 404 by 15 kilometres (9.3 mi) from Green Lane to Ravenshoe Road at the south end of Keswick. The first contracts were awarded later that year for the construction of the northbound bridge over Green Lane, followed by two structures over Mount Albert Road, west of Woodbine Avenue, begun in late 2008 and completed in 2009. By April 2011, the extension had been cleared and graded. Completion was originally scheduled for 15 December 2012 with landscaping work to continue the following spring. However, due to soil conditions and utility relocation issues, the project was delayed by nearly two years. The C$99 million extension opened on 17 September 2014. On 9 December 2016, it was announced that the segment between Highway 407 and Stouffville Road would be widened from six to eight lanes, and that an HOV lane would be added in each direction. The project will also add a carpool lot at Major Mackenzie Drive, upgrade overpasses at Highway 7 and 16th Avenue, and replace the Rouge River overpass. The project started in 2017 and is expected to be completed in 2021. Long term proposals by the province call for Highway 404 to be extended to Highway 12, between Sunderland and Beaverton. This extension would follow a new alignment to Port Bolster, east of which the freeway would incorporate the existing two lanes of Highway 48. It has drawn criticism from various environmental groups who claim it will only serve to accelerate urban sprawl north of Toronto. The following table lists the major junctions along Highway 404, as noted by the Ministry of Transportation of Ontario. ^ a b Ministry of Transportation of Ontario (2008). "Annual Average Daily Traffic (AADT) Counts". Government of Ontario. Retrieved 18 December 2011. ^ a b c d Toronto & Area (Map). 1:25,000. Cartography by MapArt. Peter Heiler Ltd. 2011. pp. 104, 320, 326, 332, 338, 344, 350, 355. §§ T26–F30. ISBN 978-1-55198-213-7. ^ a b Don Valley Parkway Extension, Highway 401 to Steeles Avenue (Report). Desjardines. 1957. ^ Google (26 April 2011). "Highway 404 Northbound Lane Configuration Approaching Highway 401 Interchange" (Map). Google Maps. Google. Retrieved 26 April 2011. ^ Ministry of Transportation of Ontario. "Highway 404 Southbound HOV Lanes at Hwy 401/DVP" (PDF). Government of Ontario. Archived from the original (PDF) on 4 September 2014. Retrieved 26 April 2015. ^ a b c Ministry of Transportation of Ontario (8 February 2002). "Backgrounder: Highway 404 Extension – Davis Drive to Green Lane". Government of Ontario. Archived from the original on 15 April 2014. Retrieved 26 April 2015. ^ Summary Report of Department Operations. Annual Report (Report). Ontario Department of Highways. 31 March 1960. p. 7. ^ "New Highway Route Metro to Newmarket". The Globe and Mail. 117 (34, 636). Toronto. 14 December 1960. p. 5. Highway Department officials tonight outlined the proposed route the new No. 404 Highway will follow from Steeles Avenue to the Newmarket area. ^ a b Dexter, Brian (25 October 1989). "Ontario Studies Plan to Extend Highway 404 Farther North". News. The Toronto Star. p. A8. ^ "Headache on the 401". The Globe and Mail. Toronto. 4 May 1976. p. 5. ^ Construction Program: King's and Secondary Highways (Report). Ministry of Transportation and Communications, Ontario. 1975–76. p. xvii. ^ "Road-Building Closes 2 Streets". Metro News / Editorials. The Toronto Star. 14 April 1976. p. B1. ^ a b Construction Program: King's and Secondary Highways (Report). Ministry of Transportation and Communications, Ontario. 1976–77. p. XV. ^ Public and Safety Information Branch (9 November 1978). "Highway 404 (Steeles Ave. to Highway 7) Opens Nov. 10" (Press release). Ministry of Transportation and Communications, Ontario. ^ Public and Safety Information Branch (9 December 1980). "Official Opening of Highway 404 Between Major Mackenzie Drive and Gormley" (Press release). Ministry of Transportation and Communications, Ontario. ^ Stevens, Victoria (21 January 1981). "York Councillors Fly Over Their Region's Traffic Chaos". News. The Toronto Star. p. A29. ^ "Ministries at Loggerheads Over Extension of Highway". The Globe and Mail. Toronto. 26 May 1981. p. 5. ^ Keating, John (3 August 1982). "404 Extension Opens Aug.10". Neighbours. The Toronto Star. p. 11. The public is cordially invited to attend the official opening of Highway 404, from Gormley Road to Bloomington Side Road on Tuesday, August 10, 1982 at 11:00 a.m. on the southbound lanes of Highway 404 at Bloomington Side Road. ^ "New Stretch of 404 to Open". Neighbors North Edition. The Toronto Star. 10 September 1985. p. NR12. Highway 404 should be open to the Aurora Sideroad by the end of September, a Ministry of Transportation official said last week.... Tenders for the next and final stage of the highway from the Aurora Sideroad to Davis Drive in Newmarket will be called in December and awarded in January the spokesman said. ^ Dexter, Brian (12 October 1989). "Highway 404 to Open to Newmarket Oct. 24". North. The Toronto Star. p. 3. ^ Howell, Peter (24 October 1989). "New 404 Extension May Worsen Traffic". News. The Toronto Star. p. A7. ^ a b Dexter, Brian (26 March 1992). "Province Urged to Study Link of Highways in North of Region". The Toronto Star. p. NY2. ^ Keung, Nicholas (23 June 1998). "Highways 404–400 Link a Go". Greater Toronto. The Toronto Star. p. B1. ^ Government of Ontario (21 May 1998). "Notice of Study Completion". The Toronto Star. p. A8. ^ Ministry of Transportation of Ontario (19 June 2003). "Eves Government to Open Highway 404/16th Avenue Interchange in Richmond Hill". Government of Ontario. Archived from the original on 15 July 2003. Retrieved 28 May 2011. Transportation Minister and Oak Ridges MPP Frank Klees and Associate Minister of Municipal Affairs and Housing and Thornhill MPP Tina Molinari will open the new Highway 404/16th Avenue interchange in Richmond Hill. ^ Ministry of Transportation of Ontario (Winter 2006). "New Southbound High Occupancy Vehicle Lane and Tunnel on Highway 404". Road Talk. 12 (1). Archived from the original on 14 April 2014. Retrieved 26 April 2015. ^ "HOV Lane Opens on Highway 404 Northbound". CTV News. 23 July 2007. Retrieved 26 April 2011. ^ Van Rijn, Nicholaas (29 August 2000). "Longer, Wider Highway 404 in the Works". Greater Toronto. The Toronto Star. p. B3. ^ Ministry of Transportation of Ontario (8 February 2002). 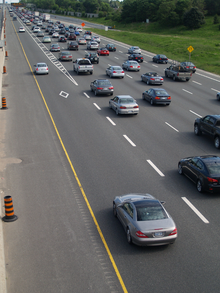 "New Highway 404 Extension to Benefit Newmarket". Government of Ontario. Archived from the original on 15 April 2014. Retrieved 26 April 2015. ^ Casey, Patrick (8 February 2002). "Drivers Have More Options in Northern York Region After Improvements to Green Lane East and Highway 404". News. Regional Municipality of York. Archived from the original on 11 March 2012. Retrieved 26 April 2015. York Region drivers can now access Green Lane East between Leslie Street and Woodbine Avenue in the Town of East Gwillimbury. The Regional Municipality of York today opened the stretch of road in tandem with the completion of a 2.9 kilometre extension of Highway 404 from Davis Drive and Green Lane East. ^ York Region Transportation and Works Committee. "Report No. 8 of the Transportation and Works Committee Regional Council Meeting of September 21, 2006" (PDF). Regional Municipality of York. Archived from the original (PDF) on 11 March 2012. Retrieved 26 April 2015. ^ "New Bridges Planned for Future Highway 404 Extension at Mount Albert Road". Daily Commercial News and Construction Record. 10 November 2008. Retrieved 16 April 2012. ^ Mount Albert interchange bridge date stamp (Bridge stamp (concrete)). Mount Albert overpass at Highway 404. 2009. ^ Highway 404 Extension Status Update (PDF) (Report). Government of Ontario. 12 January 2011. Archived from the original (PDF) on 11 March 2012. Retrieved 26 April 2015. ^ Fleischer, David (29 June 2011). "Highway 404 Extension to Open Next Year". Metroland Media. Retrieved 18 December 2011. ^ "404 Extension to Be Delayed by at Least Another Year". 680 News. 10 October 2012. Retrieved 20 August 2014. ^ Bradley, Dave (17 September 2014). "Highway 404 Extension Opens". NewsTalk 1010. Retrieved 17 September 2014. ^ a b "Ontario and Canada Partnering to Expand Highway 404" (Press release). Government of Ontario. 9 December 2016. Retrieved 11 December 2016. ^ Winfield, Mark (13 April 2006). "404 Extension a Highway to Sprawl, Environmental Groups Charge". The Pembina Institute. Retrieved 10 July 2010. ^ "2015 10-Year Roads and Transit Capital Construction Program" (PDF). Regional Municipality of York. 26 February 2015. Retrieved 9 June 2015. ^ Highway Transfers List (Report). Ministry of Transportation of Ontario. 1 April 1997. pp. 3, 4, 6–8. ^ Transportation and Works Committee (10 February 2000). Report No. 2 of the Regional Transportation and Works Committee Meeting Held on February 2, 2000 (PDF). Appendix A – Background (Report). Regional Municipality of York. p. 263. Retrieved 14 March 2015. Wikimedia Commons has media related to Ontario Highway 404. This page was last edited on 12 February 2019, at 17:40 (UTC).